Join Our Expert Advisors on One of These Educational Fly-Fishing Expeditions in Pursuit of Some of the World's Greatest Gamefish! Explore some of the most beautiful and productive angling destinations in the world as you take your fly fishing skills to the next level. Join Jon and his experienced staff as they pursue the sport’s most sought-after species. Whether you prefer to stalk bonefish and permit on tropical flats, battle billfish in the cobalt currents of the Pacific, jump giant tarpon in the Caribbean, or match the hatch for selective trout, Jon and his group of leading experts stand ready to act in an advisory capacity on each day of the trip. Furthermore, an informal workshop is held every evening to ensure that you receive the close personal attention needed to keep improving your skills and maximize your shots. "Expeditions are geared towards the adventurous fly fisher who is dedicated to becoming more self-reliant." Drawing from knowledge he garnered over decades, Jon offers advice on everything from tackle, sighting fish, flies, leaders, fish biology, stalking, and casting techniques to fish fighting, fly presentation, reading water, selecting tides, and a host of other related topics. Jon's goal is for participants to go far beyond simply catching fish. He wants you to gain the confidence and develop the skills needed to go it alone on your next adventure. To further improve your casting techniques for species you'll be targeting, an optional one-day orientation is offered at a nominal fee prior to each expedition. 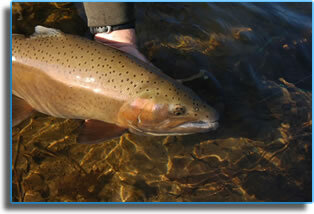 Call or email jon@jonbcaveflyfishing.com for a current list of upcoming hosted expeditions. Click on the photos below or scroll the page. Native Americans call it “Welaka” or “river of lakes,” an apt description of the interconnected chain of lakes that make up the greater St. Johns River system. Near the river’s headwat ers, a combination of shallow braided channels, fertile aquatic vegetation, and remote wilderness form what is arguably the finest largemouth bass fishery in the world and a veritable fly fishing paradise. This section of the St. Johns with an ideal habitat supports a huge population of bass with a few trophies exceeding 10 pounds. A variety of bream offer steady action as well. Furthermore, American shad provide plenty of fly fishing excitement during the winter when they make their annual migration to their natal breeding grounds. Wildlife is abundant with daily sightings of alligators, eagles, osprey, herons, and many other wading birds. Join your guides/hosts, Jon and Paul Cave, on a truly outstanding 2-day fishing ad venture as they share their unique and intimate knowledge of the St. Johns River including its fishery, history, and biology. 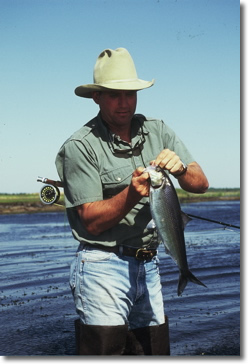 You’ll improve your casting skills and learn the habits and prime habitats of the river’s various fish species along with the techniques and tactics needed to consistently catch them in this incredibly beautiful, isolated, and natural part of “old Florida.” A review and discussion of the day’s fishing is held around the evening campfire. This exceedingly inexpensive trip includes comfortable tent camping on the river bank, non-alcoholic beverages, and camp-side meals (including a shoreline steak dinner served with a complimentary bottle of wine) in addition to the 2 days of fly-fishing for bass, bream, and shad (in season) from either an airboat or skiff. Fly tackle, sleeping bags, snacks, and fishing licenses are not included. Please contact us for pricing. Upcoming dates: Please call or email. Optional 1-day fly-fishing and fly casting workshop prior to expedition -$150 To ensure individualized attention, only a very limited number of openings are available on each expedition. A 50% non-refundable deposit is required to reserve a spot on any trip. Enroll early as all trips fill quickly. Call 407/977-0659 or email jon@jonbcaveflyfishing.com for more information. Why travel to the Rocky Mountains, Argentina, New Zealand, and beyond when you can enjoy world- class trout fishing much closer to home in the beautiful Blue Ridge Mountains of Southern Appalachia? 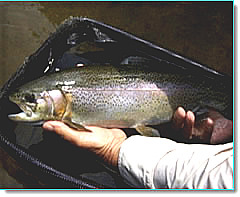 Rainbow, brown, and brook troutare plentiful and trophy-sized fish exceeding 20 inches in length are always a possibility in the over 600 miles of outstanding waters located within an hour’s drive of Brevard, North Carolina. Join guides/hosts, Jon and Paul Cave, as they teach you the techniques and tactics needed to become an accomplished trout angler. The knowledge and skills derived from this expedition will demystify the complications associated with catching trout on fly tackle. Learn to “match the hatch” with dry flies, nymphs, streamers, and terrestrials common to area waters and make a presentation that even the most selective trout will find irresistible. Snacks, beverages, fly-fishing equipment, and tips are not included. Please contact us for more information, upcoming dates, and pricing. 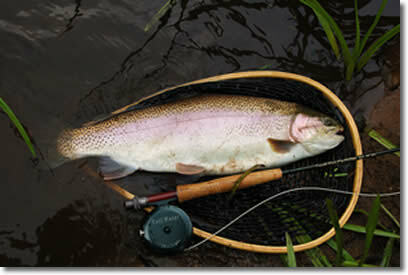 Optional 1-day fly fishing and fly casting workshop prior to trout expedition - $150. To insure individualized attention, only 6 openings are available on this expedition. Enroll early as all trips fill quickly. First come, first served. Call 407/977-0659 or email jon@jonbcaveflyfishing.com for more information. A 50% non-refundable deposit is required to reserve a spot on any trip. 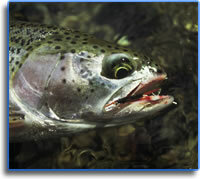 Looking for a quick weekend trip filled with plenty of exciting trout action? This is a unique opportunity to be one of only a select few anglers allowed to wade for trophy trout on the private section of the “Tic” in the scenic mountains of North Georgia. Last fall, one angler landed a fat, wild rainbow that was at least 24 inches long and there are plenty of chances to catch even bigger fish. Join us as we guide you on this beautiful meadow stream and teach you the techniques and tactics needed to become an accomplished trout angler. The knowledge and skills derived from this expedition will help you make a stealthy presentation that even the most selective trout will find irresistible. 2 full days of fishing on the limited-access trophy section of the Tic. Snacks, beverages, fly fishing equipment, and tips are not included. To ensure individualized attention, only a very limited number of openings are available on each expedition. Enroll early as all trips fill quickly. Call 407/977-0659 or email jon@jonbcaveflyfishing.com for more information. A 50% non-refundable deposit is required to reserve a spot on any trip. 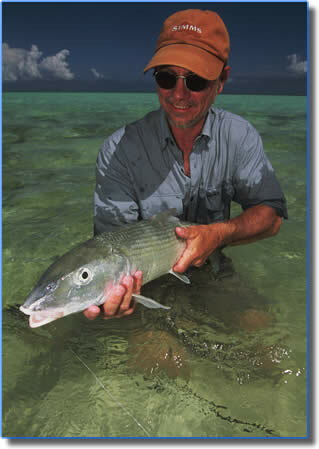 The translucent waters surrounding the islands of the Bahamas hold an amazingly large and healthy population of bonefish that average 4-6 pounds with plenty of 10-plus pounders to offer you the opportunity at the fish of a lifetime. 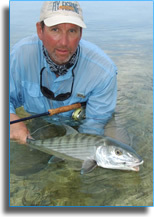 To help in your bonefish quest, we’re highly dedicated to making you a more self-sufficient fly fisher by improving both your knowledge base and skill level in order to successfully stalk bones on your own. 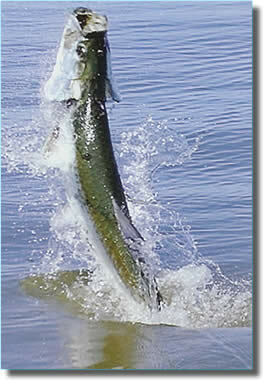 There is no better location to do that than on productive flats of the Bahamas. Since at times there are no local guides, Jon or a staff member stand ready on the water to help and provide assistance throughout the trip on everything from a difficult casting problem to locating and sighting the great “gray ghost.” Evenings are spent reviewing the day’s fishing, discussing various bonefishing scenarios, and learning the dynamics of tidal flats. Openings are limited in order to provide the personal attention you need to take your skills to the next level. Because of the extensive wading required on this trip, individuals should be in good physical condition. The bonefish expedition and workshop includes meals, groundtransportation, lodging, and use of any watercraft while in the islands. Tips, alcoholic beverages, air transportation, and any additional travel costs incurred in getting to the islands are not included. 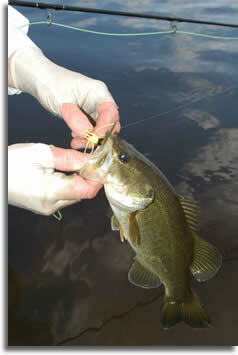 We offer a terrific piece of fly fishing nirvana for very little jack. Please contact us for pricing. A 50% non-refundable deposit is required to reserve a spot on any trip. 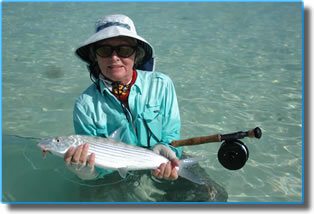 Optional 1-day fly fishing and fly casting workshop prior to bonefish expedition - $150. To ensure individualized attention, only a very limited number of openings are available on each expedition. A 50% non-refundable deposit is required to reserve a spot on any trip. “Costa Rica” translates to “rich coast” in English; an appropriate characterization of the abundant natural resources that exist in the country’s lush jungle forests and fertile waters. 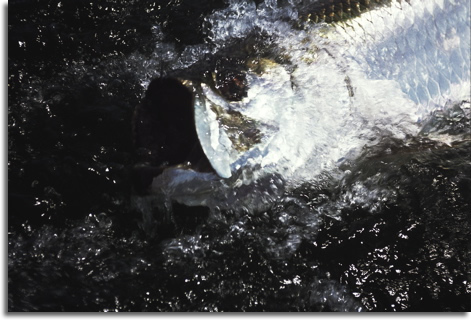 Of special interest to fly rodders, the southeast coastal waters adjacent to the Panamanian border support a plentiful population of giant chrome-sided tarpon that range in size from 40 to 150-plus pounds. Regardless of whether you’re an expert fly fisher or trying to become a more accomplished one, few places can match the area’s great opportunities for shots at powerful trophy-sized silver kings. Each day a local guide takes you and another angler by panga to look for tarpon and bait pods during the most productive tidal phases. Late afternoons are spent at our workshop for a “hands-on” discussion on casting techniques, leader construction, and the special methods used to hook, land, and fight these behemoths. 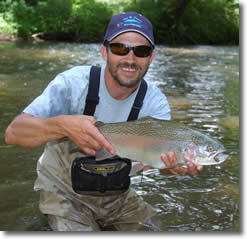 Jon or an expert staff member are also readily available throughout the day to assist you in your quest for the ultimate high on fly. 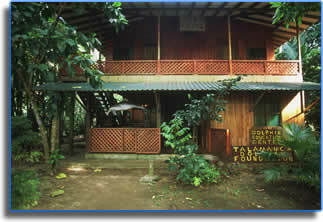 Accommodations are at a quaint lodge surrounded by an incredibly beautiful tropical rain forest where sightings of monkeys, sloths, exotic frogs, and other interesting wildlife are a common occurrence. Relax in the evening with a tasty local brew and great seafood dinner at Maxie’s, a nearby legendary establishment with an eclectic mix of travelers and friendly locals. Flies and leaders are included in the price of the trip and tarpon tackle is available for a slight fee for those who don’t have their own. This adventure/workshop includes 4 days of fishing and 6 nights with meals (at the lodge only), lodging, guides, and ground transportation between San Jose’ and Manzanillo. Tips, alcoholic beverages, air transportation, and additional costs in transit are not included. Please contact us for pricing. A 50% non-refundable deposit is required to reserve a spot on any trip. To ensure individualized attention, only a very limited number of openings are available on each expedition.